Kristi Vacanti of Pilates Plus SFV (located in Encino) just opened an amazing new studio next door. 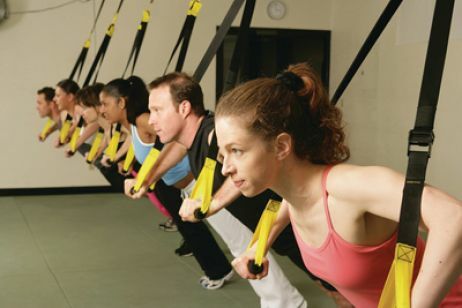 Circuit San Fernando Valley offers a variety of classes ranging from power yoga to dance and the ultimate…TRX! Most of the classes are a combination of cardio and strength training, with half the time spent running on the treadmill, and the other half on the ballet barre, boxing, weight training, or using resistance bands (TRX). Each class has a maximum of 12 people and class times range from 40-55 minutes. Classes are $20 each, but packages are also available. All you need to bring is yourself, water, a towel, and a positive attitude!!! OMG!!!! I have been hearing about TRX for a while now, and decided that I needed to check it out…not to mention the fact that I am a huge fan of Pilates Plus!! For those of you that have not heard of TRX, it is basically suspended resistance bands! We started the class off by warming up on the treadmills, and then the real fun began. We started off with planks and push-ups, your feet are suspended in the straps, and then proceeded to do a series of arms, more cardio on the treadmill, and we ended the class with a series of squats and lunges. Jackie was an amazing instructor and I can’t wait to try all of their classes. Trust me, you need to check this out for yourself! !